Capture an image using the camera, or from the photo library. On devices that don't support a camera, select an image from the filesystem. Action calls a function with the Image URI when the image has been obtained. The "Image Capture - Camera/Photo Library" action genie. e.fileSystemURL - (PhoneGap only) the native file system URL for the image. 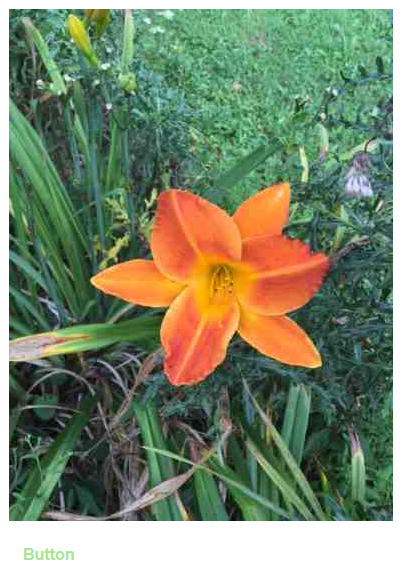 Contrast this action with the 'Image Capture for List-Detail View - Camera/Photo Library' which also allows you to capture an image using the camera. This action however, is specifically for an Image control in a List View with a Detail View. The 'Image Capture - Camera/Photo Library' action simply returns the image data (base 64 encoded) and the native file URL (in the case where PhoneGap is being used). It is up to the developer to decide what to do with the base64 encoded data or file URL. The "Image Capture - Camera/Photo Library"" action allows the user to select videos from the Photo Library. This only works in a PhoneGap application. 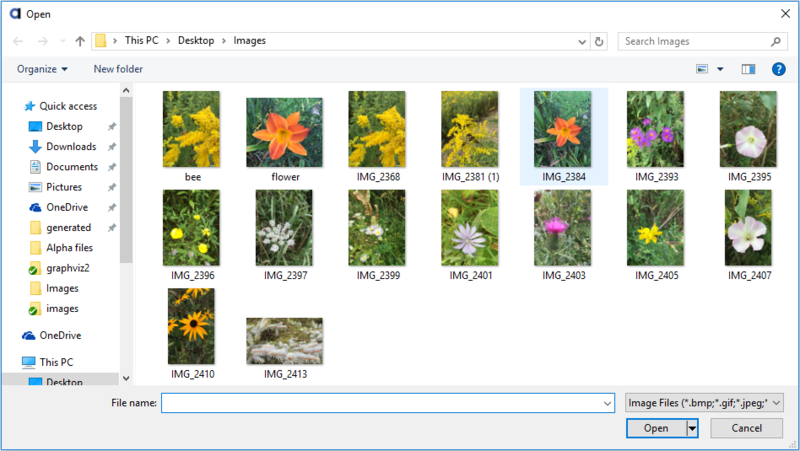 The Type property, shown in the image below, is visible if the Image capture method is set to "PhoneGap" and the Picture source property is set to "Photo Library". Specify the method for obtaining the image. If the component is running in a PhoneGap shell, then you can use PhoneGap to access the camera (if you are not in a PhoneGap shell, the user will get an error if they try to capture an image). If you select 'PhoneGapPreferred' then the PhoneGap method will be used if the component is running in a PhoneGap shell, otherwise the HTML5 method will be used. This property appears if the Image capture method is set to PhoneGap or PhoneGapPreferred. When an image file is captured using the PhoneGap the captured file is placed in a temporary storage location that could be cleared when the app is termitated. Therefore, it is advisable to move the file to a permanent location. This property appears if the Image capture method is set to PhoneGap or PhoneGapPreferred and is used with iOS. The 'public' option is the application's 'Documents directory', accessible in iTunes file sharing and backed up to the iCloud. The 'private' option relates to the application's private persisted data, which is deleted when the application is uninstalled. The 'saved' option is similar to 'private', but is backed up to iTunes. Specify the policy for resizing the image. The 'Always' option will cause the image to always be resized, regardless of its raw size. The 'Only If Image Exceeds Max Size' setting will cause the image to be resized only if the raw image size is greater than the maximum image size. 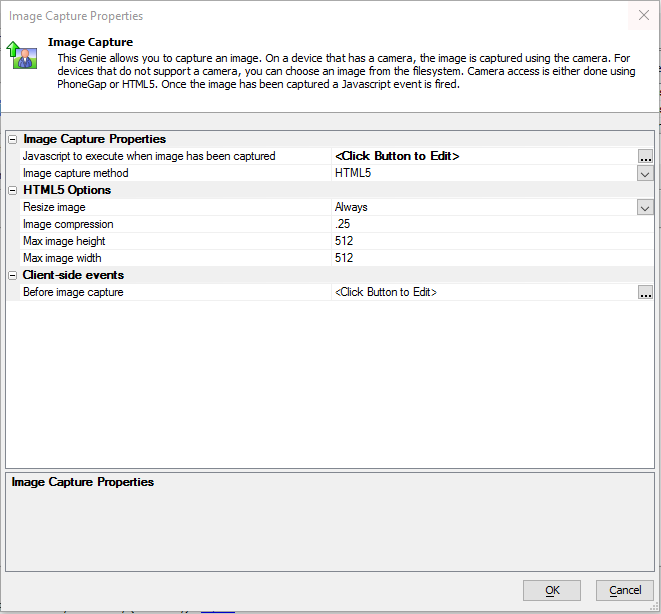 Specify the image compression factor to use when capturing an image using HTML5. When set to '1' there will be no compression. For maximum compression use '0'. Specify the maximum image height (in pixels). Specify the maximum image width (in pixels). Specify if the image should be captured by using the camera to take a picture, or if the user should select the image from the Photo Library on the device. Specify the image quality when using PhoneGap. The default text reads 'Done'. In the UX Builder on the Controls page open the 'Other Controls' menu. Click on the [Static Text] option to add a Static Text control to the component. 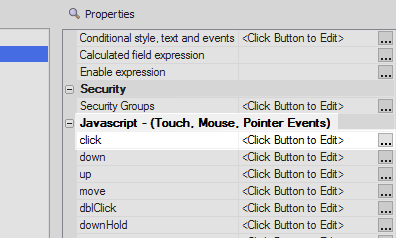 In the Other Controls menu click on the [Button] option to add a button to the component. 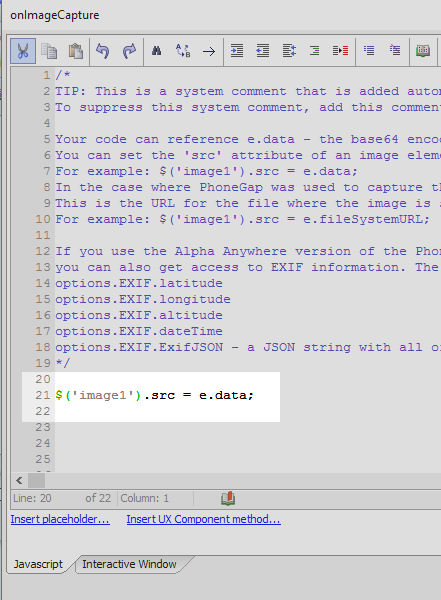 Add the following line of code to the onImageCapture event. Click OK, OK, and Save. 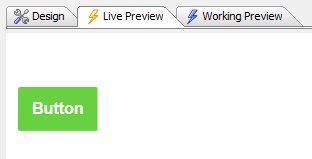 Run the Component in Live Preview. Click the Button you defined. 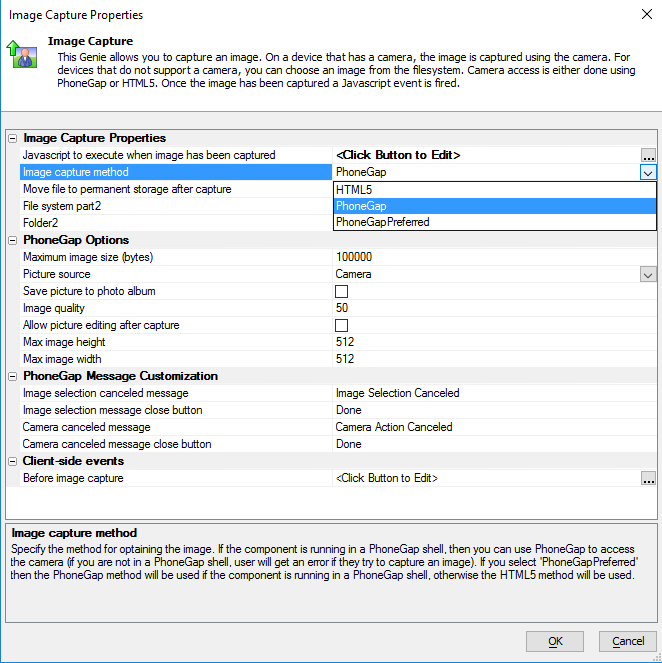 The Image Capture-Camera-Photo Library action will prompt you to open an image on your computer. Open an image. The image should automatically be displayed in the Static Text control.